It was lucky for Jamey Ray that he brought along a borrowed video camera that fateful spring evening in 2014. He can thank that camera for what happened next. Well, he can thank that camera plus Dumbo, Peter Pan, Mary Poppins and a handful of moonlighting Walt Disney World singers. Luckily, Ray remembered the camera and recorded a slightly grainy video of what came to be known as “Disney Fly Medley.” He posted the three-minute, 47-second video on YouTube just to see what would happen — and the rest is a cappella history. “That video just went crazy,” says Ray, who couldn’t be seen because he was also the impromptu cinematographer. “Disney Fly Medley” has garnered more than 1.3 million views and counting. Comments beneath the video provide a clue as to its appeal. Some are from sentimental Disney fans (it made them cry) while others are from harder-to-impress fellow professionals (it also made them cry). Across all platforms, Voctave’s videos have been viewed hundreds of millions of times worldwide. In the a capella world — and increasingly beyond it — its members are rock stars. You can hear what all the fuss is about for yourself on February 16 and 17 when Voctave will perform both a cappella and — for the first time — with orchestral accompaniment as part of the 84th annual Bach Festival at the college’s Knowles Memorial Chapel. On the program will be “Disney Fly Medley,” “Something’s Coming” from West Side Story and “The Impossible Dream” — a certain showstopper — from Man of La Mancha. The group’s Winter Park appearance comes as Voctave is hotter than ever after the 2016 release of “Disney Love Medley,” which also uses Ray’s arrangements of songs from Disney films: “I See the Light” from Tangled, “You’ll Be in My Heart” from Tarzan and “Go the Distance” from Hercules. Posted two weeks before Valentine’s Day in 2016, “Disney Love Medley” is not technically a Voctave video. It’s a duet featuring Kirstin Maldonado of the Grammy-winning a cappella group Pentatonix and her then-boyfriend Jeremy Michael Lewis. Ray’s newly reconfigured group — which had only recently begun billing itself as Voctave — provides background vocals. Although many viewers likely were drawn to the video because of Maldonado — who has sold more than 6 million albums with Pentatonix — it ended up earning Voctave legions of new fans. “Disney Love Medley” has notched more than 20 million views on YouTube alone. Although Voctave has recently signed with a prestigious New York-based management company, the group’s members plan to play only select concerts — including February’s Bach Festival in Winter Park. They’ve stepped up their recording schedule, however, and recently released The Corner of Broadway & Main Street. Voctave recently signed with prestigious Opus 3 Artists, a New York-based management company that also represents, among others, pianist Krystian Zimerman, cellist Yo-Yo Ma and the legendary Alvin Ailey American Dance Theater. In addition to select concerts, Voctave is also stepping up its recording activity. In 2017 the group released an album, The Corner of Broadway & Main Street, which features guest artist Sandi Patty on “Beauty and the Beast” as well as “Disney Love Medley” with Maldonado and Lewis. The Bach Festival will likely conjure up good memories for Voctave members since their first concert was at Rollins in 2016. Although they were already stars in cyberspace, they hadn’t yet performed together before a live audience. Ray was a student at St. Petersburg’s Northside Christian School when he was recruited to come to Rollins by John V. Sinclair, chair of the college’s department of music. 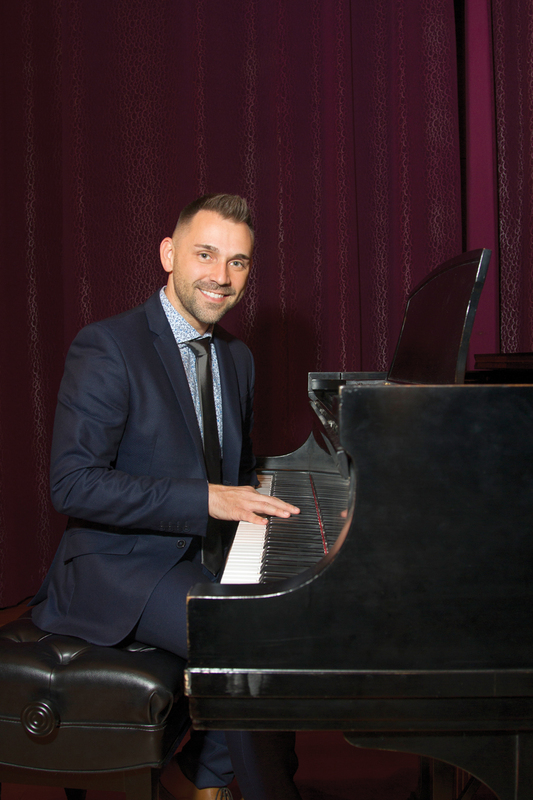 He enrolled in 2002, double majoring in music — with a specialization in voice and piano — and computer science. He developed a reputation for being a young man in a hurry. “I just remember every semester getting a call telling me that Jamey had taken too many classes,” says Sinclair. It wasn’t remarkable that Ray — a tenor and a onetime member of the prestigious Florida Boychoir — would be an excellent singer. But it was remarkable that he would also be an excellent pianist. Because of a birth defect, his left arm ends at the elbow. Gloria Cook, who was Ray’s piano professor, remembers the adjustments both had to make. She bought sheet music that been written after World War I specifically for people who had lost a hand or an arm in combat. Though Ray was a quick study and remarkably nimble at the keyboard — he can press a single note with the elbow of his left arm — it didn’t take long for Cook to see where his true talent lay. After graduating from Rollins, Ray enrolled at New York University to get a master’s degree in music technology. While living in Manhattan and attending school he wound up assisting the late Marvin Hamlisch (A Chorus Line, The Way We Were), who had won Emmy, Grammy, Oscar and Tony awards as well as a Pulitzer Prize. Posted just before Valentine’s Day in 2016, “Disney Love Medley” is not technically a Voctave video. It’s a duet featuring Kirstin Maldonado of the Grammy-winning a cappella group Pentatonix and her then-boyfriend Jeremy Michael Lewis. “It was just grunt work,” says Ray, whose job included recording and revising the notes as Hamlisch composed on a piano in his studio. Still, being around someone of Hamlisch’s caliber — and watching his creative process unfold — was a priceless experience. In 2010, Sinclair brought Ray back to join the faculty. He subsequently developed a reputation among students as a tough but fair taskmaster. Ray, 33, enjoys an easy rapport with students in part because he isn’t that far removed from them in age. Even undergraduates tend to call him “Jamey,” not “Professor Ray,” and his exacting critiques are leavened by dry humor. When he’s teaching theory or directing the Rollins Singers — a vocal jazz ensemble — his pupils seem to want nothing more than to please him. And it doesn’t hurt that Voctave’s success has given him some celebrity panache. Ray — whose arrangements have been adopted by 30 Rock’s Cheyenne Jackson and American Idol’s Diana DeGarmo and RJ Helton as well as Broadway performers Rachel Potter and Christiane Noll — is still thrilled most when he hears his work performed by the group he assembled. 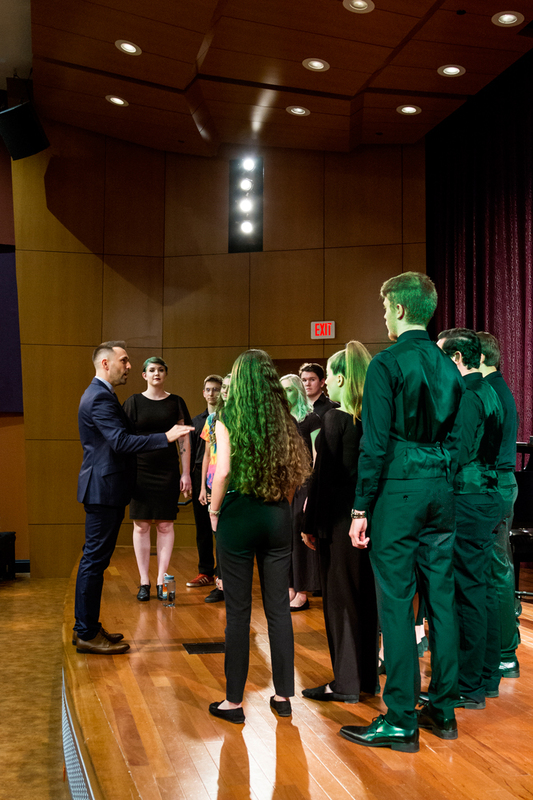 Because of Voctave, he’s in the enviable position of creating a cappella masterpieces for highly skilled singers whose voices are as familiar to him as the path he takes from his office to his classrooms.